Feel free to if you enjoy using IceHUD and feel generous. 1. How do I hide the default Blizzard player, target unit frames and party unit frames? 2. How do I turn off click-targeting and menus on the player bar? Type /icehud, expand the "Module Settings" section, click "Player Health," un-check "Allow click-targeting." Note that as of v1.3, there is now an option to allow click-targeting out of combat, but turn it off while in combat. 3. How do I hide the HUD or change its transparency based on combat, targeting, etc.? Type /icehud, check the "Transparency Settings" section. Nearly any combination of states should be available for tweaking. 4. Even if the rest of the HUD is transparent, the health percentages seem to show up. Why? Type /icehud, expand the "Module Settings" section, expand "Player Health," click "Text Settings," look for options about keeping the lower/upper text blocks alpha locked. If the text is alpha locked, it will not drop below 100%, otherwise it respects its bar's transparency setting. Player Health/Mana, Target Health/Mana, and pet bars should all have these options. 5. Is there any way to see combo points for Rogues and Druids or sunder applications for Warriors? That's the Cast Lag Indicator (or the aggro-pull warning for the Threat bar) that shows you when you can start casting a new spell and still be able to finish the current one (based on your lag to the server). You can disable this in the Player Cast Bar settings under the /icehud configuration screen. 7. Is there a bar that shows breath underwater and if so, how can I adjust it? Yes, this is called the MirrorBarHandler in the module settings portion of the /icehud configuration. It's called that because it mirrors casting bar behavior, displays more than just breathing (fatigue is one example), and that's what Blizzard calls it. It can be moved/adjusted/resized/etc. as with any other module. 8. There's a long green bar that sometimes shows up below everything else. What is it? That would be the TargetOfTarget module. That module is available for people who don't want the full ToT health/mana bars, but do want some sort of ToT representation on the screen. It's configurable through the /icehud module settings. 9. IceHUD needs a bar or counter for buff/debuff X! Good news: as of v1.5, you can create as many bars and counters for any buffs or debuffs you want! Type /icehud, select one of the custom module types in the drop-down at the top of the settings page, and press the Create button. This will create a custom module and automatically select it in the list. It is highly recommend that you rename the bar as soon as possible to avoid any confusion later. 10. How do I turn off the resting/combat/PvP/etc. icons on the player or target? Type /icehud, expand Module Settings, expand PlayerHealth (or TargetHealth for targets), click Icon Settings. You can control every aspect of the icons there including location, visibility, draw order, etc. 11. How do I turn off buffs/debuffs on the player's or target's bar? Type /icehud, expand Module Settings, expand PlayerInfo (or TargetInfo for targets), select Buff Settings or Debuff Settings, and un-check "show buffs" (or "show debuffs"). 12. How do I turn off these big huge bars that pulse whenever one of my abilities procs? This isn't IceHUD - it's Blizzard's new Spell Alerts they added in 4.0.1. Interface options => Combat => "Show Spell Alerts" to turn them off or search for a mod to tweak their positioning/size/etc. 13. I don't like where some of the bars are placed. How do I put the health/mana on the left/right? Type /icehud, expand Module Settings, expand whatever module you want to move (e.g. PlayerHealth, PlayerMana), and adjust the "Side" and "Offset" settings. "Side" controls whether it's on the left or the right and "Offset" controls how far from center it is. 14. Which module displays Monk Chi power? 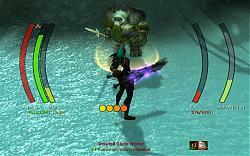 Prior to v1.11.2, this module was called HarmonyPower. Harmony was the original name for Chi back when 5.0 was in beta, so I used Blizzard's name for it while I was developing for Cataclysm. IceHUD v1.11.2 changed this module to be called Chi. 15. How do I add commas/periods into big numbers like health? If you have DogTags enabled, you can open the Text Settings for the module in question and add SeparateDigits() around the tag you're trying to split up. To display Health/MaxHealth with commas, use: [(SeparateDigits(HP):HPColor "/" SeparateDigits(MaxHP):HPColor):Bracket]. To use periods instead of commas, use: [(SeparateDigits(HP, ". "):HPColor "/" SeparateDigits(MaxHP, "."):HPColor):Bracket]. Use the /dog help menu to build your own similar tags for Mana, etc. 16. The countdown timers on buffs and debuffs completely obscure the icon. How do I disable the timer text? IceHUD is not responsible for this countdown text and cannot control it. The 6.0 patch added an option in the game client to display counts on top of cooldowns. Look at the Action Bars menu under the game's Interface options. You can turn the text on or off there. Mods like OmniCC or CooldownCount will generally give you the same feature but allow you to control when, where, and how the text shows up. 17. When I rotate some modules 90 degrees, such as the castbar, the bar appears to wiggle up and down as it fills or empties. How do I fix this? This is a side effect of the animation API that I'm co-opting to force a rotation without having to provide duplicates of every bar texture in the mod. Any bar moving sufficiently quickly and updating rapidly will cause this. 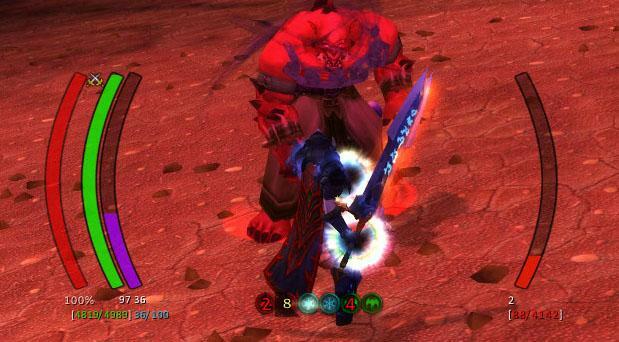 IceHUD is intended to be a vertically-oriented mod, so the rotation feature is there for people who are willing to accept the side effects that come with it. My suggestion is to use one of the many horizontally-oriented bar mods out there if you're wanting horizontal bars. Quartz is a good castbar replacement that you can use and disable IceHUD's built-in castbar, for example. 18. How do I get rid of the bars that showed up beneath the player in the 7.0 patch? 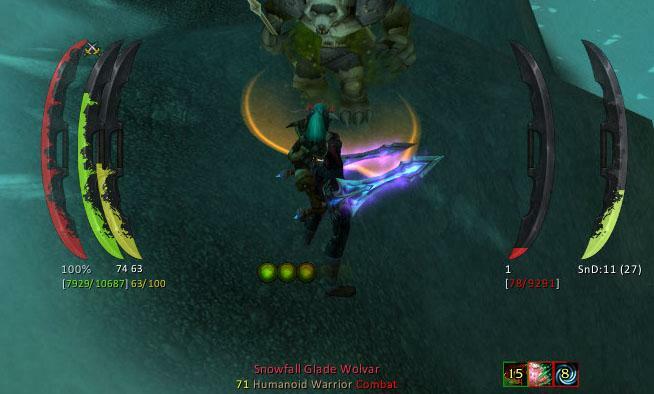 Blizzard added a "Personal Resource Display" feature in the 7.0 game client. You can disable it in the Game options -> Interface -> Names -> Personal Resource Display. - Fixed player health never quite reaching full (and therefore never adhering to "full" alpha settings). It seems like a WoW client patch caused UNIT_MAXHEALTH to stop firing. - Fixed Warlock shard numeric formatting incorrectly in non-Destruction specs. 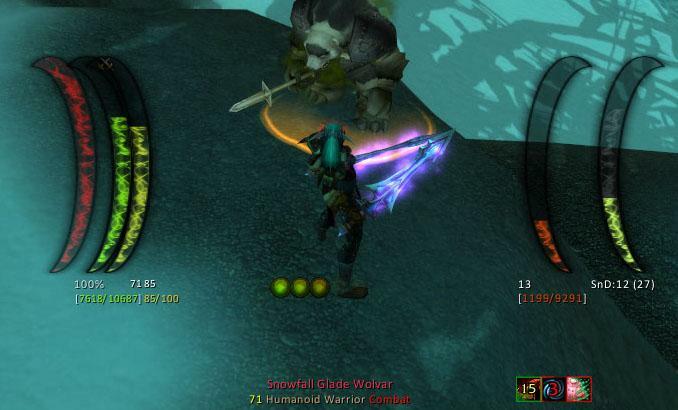 - Possibly fixed reported bug with Brewmaster Monks' Stagger bars. - Added several spells to be tracked in the CC modules. - Only show placeholder icon on custom bars when in configuration mode (fixes placeholder icon showing up for abilities the player hasn't enabled yet, like Survival Hunter's Bombs). - Fixed Custom Cooldown bars not displaying properly when both "ignore range" and "only show with target" were checked. 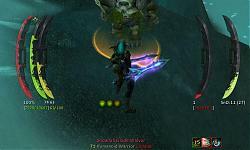 - Added Rogue's Between the Eyes stun to the CC stun bar list. - Added option (enabled by default) to hide mod during shell games. - Packaged new LibDogTag-Unit to fix hostile NPC class names displaying in all caps. - Fixed cast lag indicator updating randomly mid-cast. - Balance druids with Nature's Wrath now treat 50-100 astral power as full for alpha purposes (so the bar will fade to "out of combat" levels when resting around 50%). - Fixed the GCD and player castbar lag indicator to show up again. - Fixed a longstanding bug where the castbar lag indicator would sometimes be the size of the full bar if the mod never received the client-side "started casting" notification. - Improved reliability of castbar lag indicator. Blizzard doesn't offer the necessary events to display this with 100% certainty. - Fixed an error caused by the Runes module when toggling "Hide Blizzard Frame" off. - Fixed Roll the Bones coloring when gaining 5 buffs. - Added option to hide the raid icon for Info frames. - Updated shard texture for Warlocks. - Updated shard display for Destro Warlocks (ticket #234, thanks stencil!). - Fixed an error in IceHUD's usage of GetLFGProposal()'s return values exposed by the 7.2.5 Chromie quests. - Fixed error on 7.2 due to a CVar being removed. I got this error when was ejected from a Spark Bot on the High Tinkerer Mekkatorque encounter. This is the only addon I have which uses LibDogTag and searching my WoW installation has it only show up as a subdirectory in IceHUD. Thanks for the report. I'll get it over to the DogTag project. Obviously only an issue as Destruction. I deleted IceHud and its settings and then reinstalled it. Briefly, when I logged in as a Destruction Spec Warlock, I had Soul Shards displayed with Decimals and everything was great. Then I switched to Afflic, ran a dungeon, and switched back to Destruction to see if all was still well. The decimal is gone. All I see is an integer. Is there a way to see my soul shards displayed as a Decimal? Looks like there was a bug for non-Destruction warlocks that was causing this to be formatted as an integer. It'll be fixed in the next release. Thanks for the report! I've noticed that the shield from the Resounding Protection trait shows up, sometimes, when I'm out of combat and have nothing selected. I looked to see if there was a separate setting for it but couldn't find one. Irritatingly it isn't consistent, I've had it stay visible while it was a full shield, not a slightly damaged one. I swapped the piece on and off and it behaved correctly. If I get some time I'll try to look into this. I keep this bar off, though, as I don't find it terribly useful personally. Was playing with that build last night and it works for the most part. Most of the time the indicator is there but every so often it hides away again. If I notice any kind of pattern I will let you know but so far it seemed fairly random whether it would show or not. No, you're not missing a setting. It should just work. I will take a look at this tonight, but I feel like it has been working for me. edit: wow, you're right. Cast lag has been broken since 8.0 and you're the first to notice. I'll get a fixed build out soon. Thanks for reporting this! No worries thanks for getting a fix out so quickly, it's working now! Love this addon but I can't seem to get the lag indicator on the cast bar to appear. Is there a setting I'm missing somewhere? I've been through all IceHUD's Castbar module settings and messed around with the lag indicator alpha and respect lag tolerance but it's still missing even when other cast bars show their lag indicator. Last edited by Parnic : 08-16-18 at 09:31 AM. Hi, Love the addon. Is there a way to change the bar colours? e.g 'Target Health'. In the UI options I see there is a subsection called colors but nothing changes when I alter them. I have tried running Icehud by itself and reloading the hud after making changes. Un-check "scale health color" and you'll be able to make all sorts of color changes. I'm assuming you have other mods enabled than just IceHUD? Some mods are coded to explicitly re-enable the Blizzard castbar module if you don't have their "disable" checkbox checked. Try running the game with ONLY IceHUD enabled to see if the problems goes away. If it does, you'll have to re-enable mods a few at a time to isolate the misbehaving one. That's a good idea, I should be cluey enough to have tested that already. I didn't think I had anything which did anything to it but I found it in CursorCDtimer. I've got another bug though, I'd not run into it in the past as my old profile had Allow click-targeting disabled. It had been like that for a very long time, I'd forgotten it was an option, I thought it might be useful so I left it enabled this time. I then ran into a problem where one of my mouse bindings, which is mapped to Backspace, would stop working. So it's a conflict with Clique however nothing is bound to this button in Clique! I tested with only these two addons enabled, not sure where to go from here. For now I'll just leave the click-targeting option off for my druid. On my priest, who has many Clique bindings set up for Holy and Disc, it works fine. That key binding is for Renew or PW:S.
However for Shadow it doesn't, for shadow spec that button is set up to enter/leave shadow form, which is a Stance, on my druid the button is also for a Stance. It isn't configured in Clique as it's just a binding in the default key bindings interface. How do I get around this interaction? Recently I rebuilt my setup from scratch, I thought it might be time as you've added many new features since I made it about a decade ago! I thought it might have been the cause of a bug I'd been getting with the Blizzard cast bar showing up even with it turned off, however it's still happening after this. Given their aren't lots of other posts about this I'm not sure what to do next, so I thought I'd ask to see if you had any tips. This mod is developed in my free time and has been actively maintained for the past 6+ years. If you enjoy using it, please consider donating a few dollars to help its continued development. Thank you for using IceHUD!